Its #AgingPetsAppreciation month and as a tribute to my late senior Shih Tzu Mr. JoeJo, I have finally the strength (or at least I am telling myself so) to begin writing about him 13 months after his passing. It had never occurred to me to rescue a senior dog. Especially since the month before a little 5 month old Shih Tzu had pranced into my life. But there he was. A scruffy little guy, in a crate in the back of a car and not looking very happy or friendly. I was sad when I saw him because I knew he was not going to be fit to be adopted out, and it seemed that euthanasia would be the best option for him. Mind you, I hadn’t been in rescue that long, and from watching other rescues around me, this was the option that came to mind. Fortunately I had a friend that had experience with senior dogs who encouraged me to take a chance with him. From the moment he came into our home, I think he knew he was home. He now had a comfy bed and sofa to lay on, he had more toys than a little dog needed or could play with. And best of all he was on his road to recovery from the illnesses he was afflicted with and the damage previous years had done to his little body. Mom… this basket is not big enough! The simple fact of the matter was that when JoeJo came into my life he was 14 years old. A purebred little Shih Tzu who had been purchased from a breeder, but because of improper care and age came to me the way he was… a complete mess. But you know what? That was okay. Dogs age and get sick, just like people. There are no guarantees in life, only that we are going to die. But what I think is important in life are the lessons we learn from the dogs who are with us. Things in life just can’t be rushed. There were many times as JoeJo suffered through bouts of ear infections, pain from a deteriorating jaw and countless other ailments along with the inability to eat at times (yes he was tube fed 3 times) that I couldn’t give up on him or finding ways to get him on a healthy track again. There was no time did I ever feel that he didn’t want to go on or that I was just putting off the inevitable. You could see it in his eyes, the will and fight to be healthy. My vet always said I would know when that day would arrive and I did. I will always say that I have a great veterinarian. I do wish my vet was a holistic vet, but he’s not. What he is is a vet who allows me to be hands on with my pets care, trusts my research abilities, and most importantly listens to what I have to say. From experimenting with different diets, supplements, laser treatments on his ears… I did everything I could to prolong his life giving him the quality he deserved. It’s the last part of the definition that got me. My desire to alleviate his suffering was so strong that I often didn’t care about my wants or needs because JoeJo came first. Thank you for joining me in this series, The Joy of JoeJo. Next week we continue with The Faces of Doggie Alzheimer’s. A short journey into the darkness of Canine Cognitive Dysfunction. 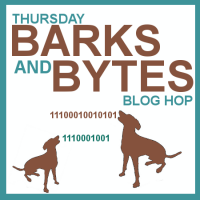 We are happy to be participating in this weeks Thursday Barks and Bytes Blog Hop hosted by 2 Brown Dawgs and Heart Like A Dog. Such a heart warming post. What a lucky dog that he had so much love & a great home for the rest of his life. Thank you for sharing with the Pet Parade and joining our pawty! What a great post! He is such a sweet boy, seniors teach us so much, they definitely change our perspective a bit. My mom was never a big dog type person, she prefers little dogs that can be on her lap. When our Lab mix got sick in early 2012, I was so surprised when she was rearranging the house trying to make his path to get outside easy and laid down carpets all throughout the kitchen and house, just so he could have some stable walking areas. She wanted to alleviate his pain, she would do anything she could for our old man at that time, and it was so awesome to see. Okay Christine, first you boo-hooed when reading about Leo, now I’m crying reading about JoeJo. What a heart filled post! You nailed it – so open, so honest about your feelings. I loved reading this because I could sooooooo relate. I’m intrigued to read your post about The Faces of Doggie Alzheimer’s. Have a great weekend and again, thanks for sharing this. You have a heart of gold. What a wonderful gift you gave that dog. That last picture is wonderful. Thanks so much for sharing JoJoe’s story on the hop. My first fur baby as an adult was a Shih Tzu named Holly. She lived to be 17 and a half. I always wondered if I waited too long to say good-bye. She was blind and deaf towards the end. Unfortunately, my mom suffered a major stroke in the last few months of her life and we were never home. She always enjoyed the plain McDonalds cheese burgers we brought home every night. It took me a very long time to be able to make a shadow box to honor her. I still miss her! I really think Shih Tzu’s touch us in a way different from other dogs… I’m sure Holly was so understanding of the circumstances in the end… they are great that way. Christine, you have a very big heart and I am so glad you were able to share it with JoeJo. He was a very lucky boy to have been adopted by you. And it is obvious that he gave you so much in return. You can always treasure the memories of the special relationship you had with him. Thank you so much… he was very special. I think there is something different about having a male dog, especially in a house of 9 females!! This brought tears to my eyes. My own Sampson just turned 10 and Delilah will be 9 in December. It is hard watching them age. The stiff joints, the arthritis, the injuries and illnesses. But with all the joy they’ve brought me, I will do every thing in my power to make sure they have the very best I can give. Thank you for sharing JoeJo’s story. I’m so glad your friend talked you into taking a chance. And thank you for joining the blog hop. Jodi recently posted…What Do You Do When You are Accosted by Off-Leash Dogs? Such a sweet post and tribute to JoeJo. Love the picture of him with Katie. I’ve been working on an alzheimer’s post too – since our dog Tino had it. I’ll be interested to read about your experience. Seniors are definitely so sweet and so deserve a good home. It takes a special person to adopt one at that age. Our lives are so short, Mom likes to adopt us young so she has the maximum time possible to spend with us. With my sister Katie being a senior, we know firsthand how sweet seniors are, but there are also a lot of challenges and sometimes it is hard to see the changes that happen with age, but we love her to death. Good for you having adopted JoeJo. I’m sure she is dearly missed.